The Credit Card Order Process is one of the common uses of the flowchart diagram, allowing everyone involved in handling credit card payments to follow through a strict procedure. This method helps to ensure there will be no errors when receiving funds via electronic payment. 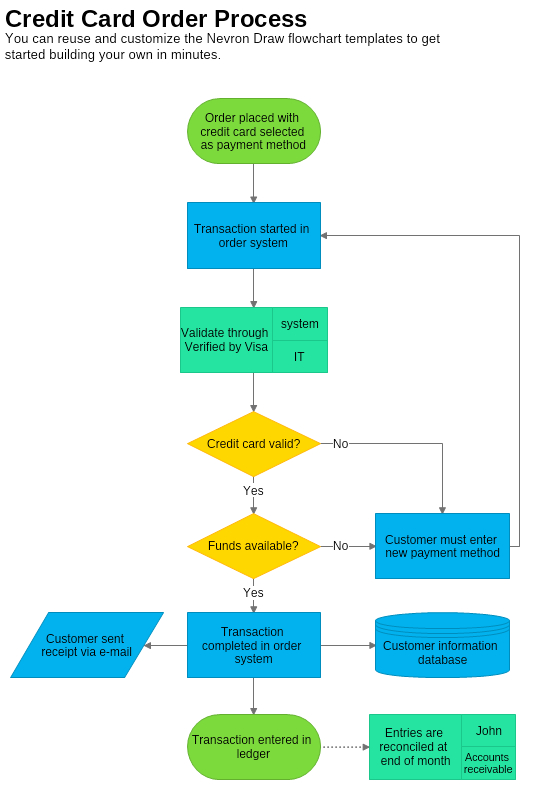 The Credit Card Order Process diagram can be created as an instruction manual for both employees of the company, or the IT team which is implementing the necessary checks before considering a payment complete and sending the information to the accounting department. To ensure your company's Credit Card Order Process is well handled download this template and open it in Nevron Draw.